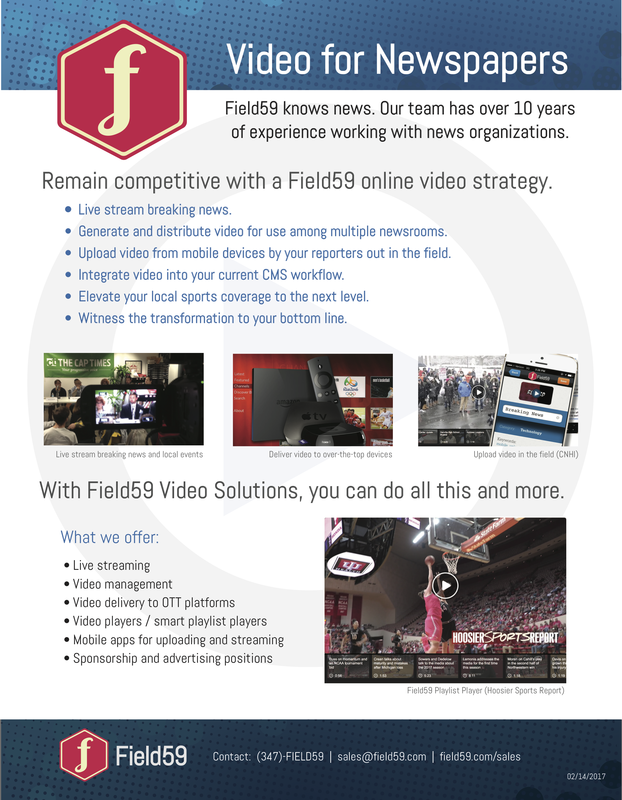 Field59 can also deliver your stream to other platforms that have their own streaming infrastructure and distribution, such as YouTube Live. By following the steps in this article, you can stream content on YouTube live while also streaming through the Field59 player, simultaneously recording your stream to create a video archive in your Field59 account. Due to a requirement by YouTube, the stream must include audio. First, go to the YouTube Live Events page to create an event that will receive the live stream from Field59. It is in a subdirectory of the Video Manager. (Note: It may take you a bit to sort out how to access this page. YouTube has a new interface at studio.youtube.com, but it’s in beta and not all features are available. 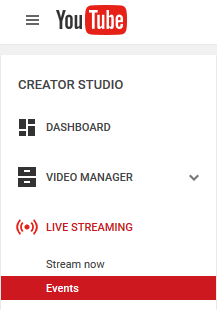 Look for links to take you back to the “classic” YouTube creator studio to access live stream settings). If you haven’t already enabled live streaming on your YouTube account, you will be prompted to do so. Click New live event near top right. On the Basic info tab of the Info and Settings page, enter information about the stream (title, description, tags, etc.) into the fields. Set the start date and time. Click on Add end time to set an end time for the event. At lower right in the Basic info tab, locate Type. Select Custom (more encoding options). Then click Create event at bottom right. After you create your event, you need YouTube to generate a Stream Name and Primary Server that Field59 will use to publish your Field59 stream to YouTube. You will be working here in the Main Camera tab of the event’s Ingestion Settings page. First, add a Thumbnail to your event if you would like (It will use your account profile image if no custom thumbnail is chosen). 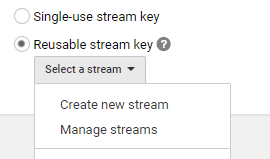 Next, choose “Reusable stream key” (otherwise you would have to update this information with TownNews for each live event you want to do on YouTube). If this is your first YouTube event, Create new stream, and create a streaming profile. Give your stream profile a name. 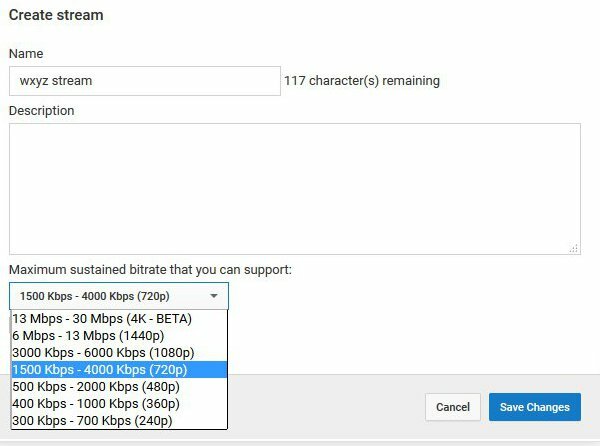 Under Maximum sustained bitrate, select the ingestion option that best represents your network and encoding capabilities. Choose the 1500 Kbps – 4,000 Kbps (720p) range. Field59 typically outputs your source as 1280x720, and YouTube cares most that the resolutions match (it’s OK if your bitrate is below 1500 Kbps). If this is not your first YouTube event, simply select your pre-saved custom stream profile from the dropdown. Closed captions: If you are a broadcaster required to publish captions with your stream and you are using a Field59 live encoder, be sure to configure the optional captions setting by choosing Embedded 608/708. Start your encoder if it’s not already running. The stream will ingest on Field59’s live platform. Once Field59 has configured your YouTube Stream Name and Primary Server credentials, Field59 will stream the video to your YouTube event. To check that YouTube is receiving and playing the stream, go to the YouTube Live Control Room page for your event, and click the Preview button to enable the YouTube to process the incoming stream. Hit the Stop Streaming button at any time to end your event, if you wish to end the event prior to the end time you set under Basic info. When your event ends, YouTube will convert your event into a video in your YouTube video manager. If you wish to stream through the Field59 player and record your stream into your Field59 account at the same time that you are streaming to YouTube, follow our guides to publishing live stream events and setting events to record in the Field59 manager.